Cats are natural climbers and love a high perch on which they can lounge or survey their surroundings. Cat stairs make for hours of fun for your curious feline, and can be helpful to the aging kitty who hasn't lost her desire to climb. 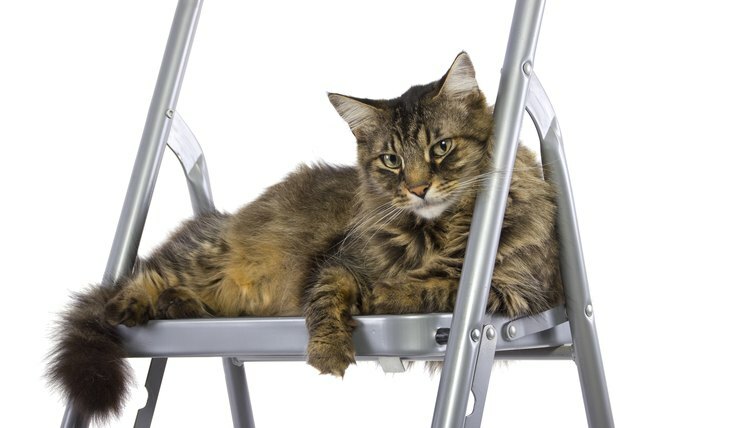 Cat stairs and climbs are available commercially, but by creating your own as a DIY project, you can customize them to fit your space, your cat's needs and your décor. Measure a 45-degree angle on the end of one 2-by-8 board using the quick square. Mark it with your pencil. Repeat step on the other end of the first board. Repeat step with both ends of a second 2-by-8 board. Use the circular saw to cut all four ends of the two 2-by-8 boards at the angles you marked in step 1. Sand all rough edges. Measure the remaining board for your stairs. For cat stairs, 8 inches deep is sufficient. Measure and mark every 8 inches for the length of the board. You will have measured out 14 stairs. Use the circular saw to cut the stairs. You'll have two extra stairs, which can be used as shelving on which your cats can perch. Sand all rough edges. Determine where you want to place your stairs. If you're planning to mount them on the wall, it's best to build them in a workshop and temporarily mount them at the same angle they'll be in your space. You'll attach the stairs from the outer side of the long boards, so make sure you can move around your project. Attach only one long board first. You'll attach the second board when all stairs are attached to the first board. Measure 6 inches from the floor and mark your measurement. A rise of 6 inches is fine for cat stairs. Check the position of your board using the level. Use the power screwdriver to attach the first stair to the board. Place a screw every 2 inches for maximum stability. Measure up another 6 inches. Repeat steps 9 and 10 until all stairs are attached to the first board. Mount your second board so that each stair is flush with the board. Secure all stairs to the second board as you did in step 8. Paint or stain your boards and stairs to match your existing décor. Add carpet, treads or even heavy fabric to match your décor. Secure to wall to allow your cats to climb to their favorite cat-friendly shelf. Always wear protective gear when operating the circular saw.